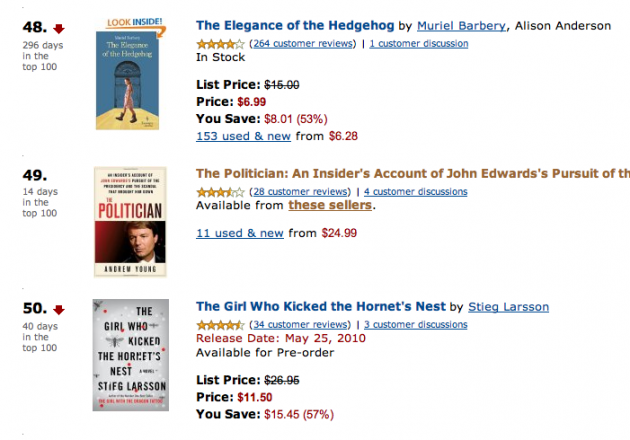 There’s been a lot of hoopla the past week over Amazon’s fight with book publisher Macmillan. The main issue is that Macmillan wants higher prices for its e-books, while Amazon wants to keep prices down for its Kindle device. Amazon went as far as to pull all of Macmillan’s books from its store, but quickly admitted that they’d eventually have to give in to Macmillan’s demands. Why? Well the obvious answer is Apple, whose new iPad device with its iBooks Store is allowing publishers to set higher prices. But don’t forget Amazon’s other rivals too. 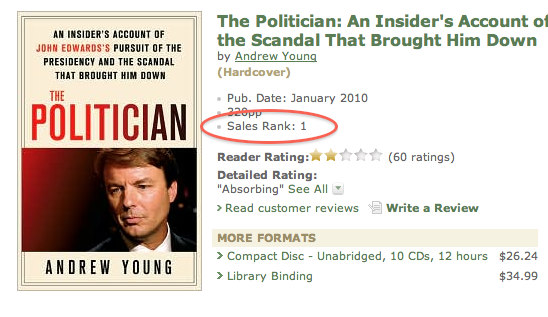 One reader wrote in to tell us how he was looking for The Politician, a new book by Andrew Young about John Edwards. The book, which is published by Macmillan, is not available on Amazon.com right now due to the dispute. When the man noticed that he turned to Amazon rival Barnes & Noble for the book — and from the looks of it, he’s not alone. The book is actually the number one best seller on Barnes & Noble’s entire site. On another rival’s site, Borders, it’s the number five best seller. Pressure from Apple aside, Amazon can’t afford to blackball these publishers because people can so easily turn elsewhere to get the book. Even though it’s not available on Amazon, The Politician is still the number 49 best seller on the site through partner sellers — even though they’re selling the book for significantly more than Barnes & Noble or Borders (or than Amazon would if it were available through them).